Don Cherry is one of Canada's most recognizable figures and a true icon in the hockey world. Those facts cannot be contested. The two two-part mini-series released on the charismatic former Boston Bruins coach give poignant insight to the young aspiring hockey player and his rise to prominence as a television personality on CBC's program, "The Coach's Corner." In the first installment of the Don Cherry story, Keep Your Head Up, Kid picks up the story of a young Donald Cherry attempting to make his break into the NHL. Playing on several junior hockey teams and AHL squads, most notably the Rochester Americans, Cherry struggles to find his game and develop into an NHL level quality defenseman. Cherry, after finding his niche as an enforcer, goes to the bar after a tough game with his teammates. While at the bar, he meets the love of his life, Rose. From that moment on, Rose is wrapped up in Cherry's hockey successes and failures, goals and bruises. While Cherry was not playing hockey, he served as a construction worker, working with a jackhammer after season's end. Cherry was a hardworking, loyal, and genuine man who would help anyone in need and stick true to his word. While he and Rose's relationship in the main theme of the film, it is his tumultuous relationship with famed coach Eddie Shore that is also on display. Following his playing days, Cherry would then go on to coach the Rochester Americans as well as serve as their general manager. After some successful years in the AHL, Cherry would get the call-up to coach the "Big Bad" Boston Bruins, where his legend would begin to take form. The film follows his up and down relationship with then General Manager, Harry Sinden and the trade that shook up the hockey world when the Bruins sent Phil Esposito and Carol Vadnais to the New York Rangers in exchange for Brad Park and Jean Ratelle. His relationship with "Number Four" Bobby Orr is also documented quite well as Cherry still believes that Orr is one of, if not the greatest, hockey players to have ever played the game. Keep Your Head Up, Kid ends with a brief glimpse into Cherry's future profession as a hockey commentator. Over the two-part series, his relationship with Rose, difficult relationships with players and general managers, and heartbreaking losses to the rival Montreal Canadiens are all highly identified and respected. The series was intended to be a one-off, but due to its popular success, a sequel was in the making. After his firing from the Boston Bruins, Don Cherry was relegated to the role of a hockey commentator, something that fans nowadays find hard to believe that he struggled with. Cherry was shy personality at first on the microphone, but once he established who we was meant to be, his charisma shone through on the microphone and camera. Cherry coached one more season professionally for the then Colorado Rockies and brought them close to a playoff birth. Due to a change in the office, Cherry was let go after a relatively successful season behind the bench. Cherry, after doing several lecture series all across Canada persuaded Rose that he would want to give the CBC one more chance and uproot the family to Toronto. 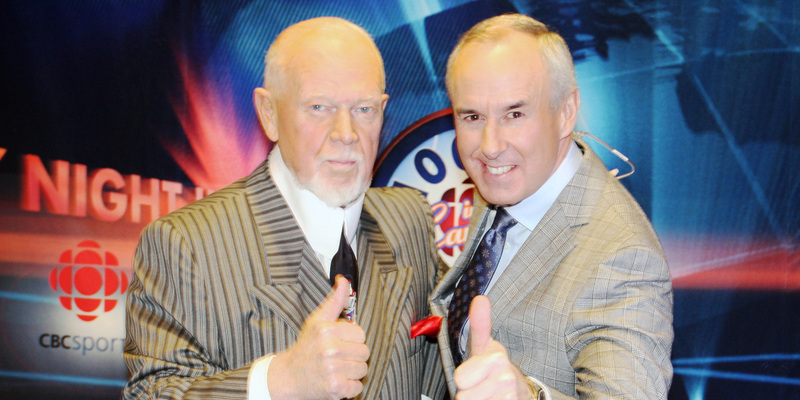 Upon accepting his job, it is in The Wrath of Grapes where the audience gets to see the relationship between Cherry and his co-host of "The Coaches Corner" for the last 30+ years, Ron Maclean (Jonathan Watton). What appears as a cordial bond on-screen was not always that as the two polar opposite personalities clashed many times on and off-screen. Rose also plays a vital role in the second film, but her tragedy is brought up in more detail in the second film. The audience finds out that Rose is sick and Don is conflicted between his wife and his job. He volunteers to stay home and care for Rose, but Rose, the anchor of the Cherry family, persuades Don to continue on with his duties. In typical Cherry fashion, he rebels. What separates this film from the previous is that there are flashbacks to Cherry's teenage years and also shared narration from Don and Rose's point of views on different events throughout their lives. The last portion of the film shows his constant struggle with the CBC higher-ups and their attempts to fire Cherry due to his outlandish and sometimes defaming remarks. Although Don's remarks were controversial, he did not waver on who he was and continued to be the eccentric co-host with his flashy and sometimes gaudy jackets. 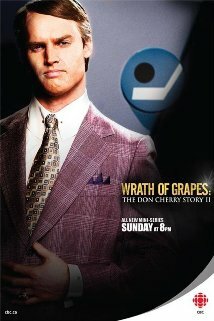 The Wrath of Grapes is a rare sequel that is better than the original. It is funny, dramatic, and filled with tense moments that give even more light on the man who has become an iconic Canadian personality that will never be outdone nor forgotten. The two series, Keep Your Head Up, Kid and The Wrath of Grapes star Jared Keeso as Don Cherry and Sarah Manninen as his beloved wife, Rose. The chemistry between the performers is fantastic and Keeso's performance of Cherry is absolutely spot on; perfect in many ways. The auditioning process to play the hockey legend took over two years, but Keeso was the right choice and there is no denying that. Manninen as the sweet, but strict Rose played well off of Keeso. The relationship between Rose and Don is a central theme in both parts of the films and brings the viewer on a rollercoaster ride of emotions throughout. While the acting is not the greatest, it is the emotion and story that carries the series. What is also a phenomenal feat is how director Jeff Woolnough and writers Andrew Wreggitt and Don Cherry's son, Tim, tackle real life scenarios with spot-on reenactments. Once again, Keeso shines with his exact delivery and body gestures. The Don Cherry Story is one that will be passed down from generations to generations in Canada. Don Cherry is presented as a loving, caring and supportive husband and father, a loyal, rough and tumble enforcer on the ice and a winning coach who got along more with the boys than he did management. His over the top personality on camera is what most know Cherry for, but after viewing both installments, one walks away with a brand new respect and admiration for Don Cherry, a man who never had anything handed to him; a man who worked hard for everything he has and has become. I give this series a big, Don Cherry thumbs up.